Here we go again as tomorrow will see the resuming of the League Cup competition with another chance for the clubs to complete for a silverware. 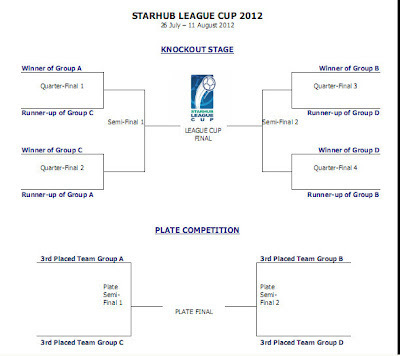 What has made it more interesting is that everyone will have their fair share of chances of grabbing one of the two pieces of silverware offered in this mid-season tournament now renamed as "Starhub League Cup" with the sponsorship that tied with the package announced earlier of the year. Just to reiterate that this year's competition will have the 12 S.League teams (with the exclusion of Harimau Muda) split into four groups of three teams on a round-robin basis. 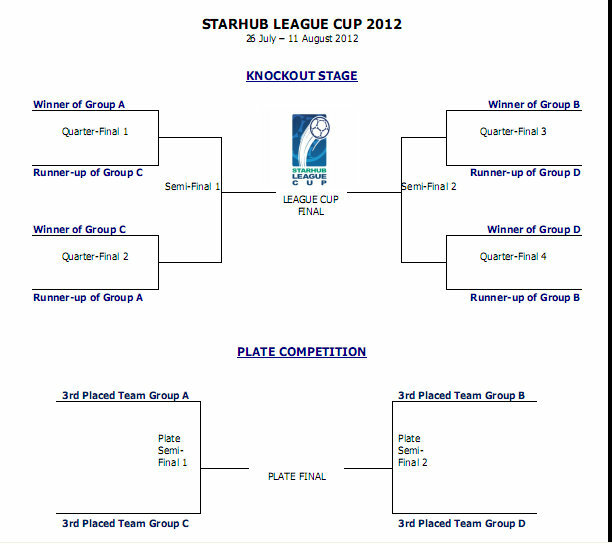 Top two teams from each group will qualify for the Quarter-Finals before proceed to the next stage of the tournament, while those teams that finish bottom of their groups will qualify for the Plate Competition (see depicted in the image below). The last two years had seen foreign sides walked away with the trophy with Albirex Niigata (Singapore) hope to be the first team to retain the title in the competition history after they won it last year. Or could it be an underdog side to triumph this year with the Cup having a reputation of staging a few giant-killing acts like how Woodlands Wellington edged out Tampines Rovers en-routed to the final in 2010 where they lost to Etoile FC?